Has Wonderful Walnut Hardwood Cast its Spell over YOU? First, some background. Eastern black walnut (Juglans nigra) is native to eastern North America (https://en.wikipedia.org/wiki/Juglans_nigra#/media/File:Juglans_nigra_range_map_1.png) and commercially important. It’s treasured for its rich and distinguished appearance; in particular, its distinctive brown coloration and its tight, straight grain pattern. Plus, despite its heft and durability, walnut wood can be easily worked, so it’s perfect for woodworkers to craft into fine furniture, cabinetry, flooring, ceiling paneling and countertops, for example. In terms of demand, Walnut trails only Maple – America’s favorite hardwood, due to its hardness and neutral colors, which make it complementary to almost any kitchen décor. Interestingly, the gap in demand between maple and walnut has been narrowing for years, despite the steadily-expanding price gap between America’s two most favorite hardwoods. 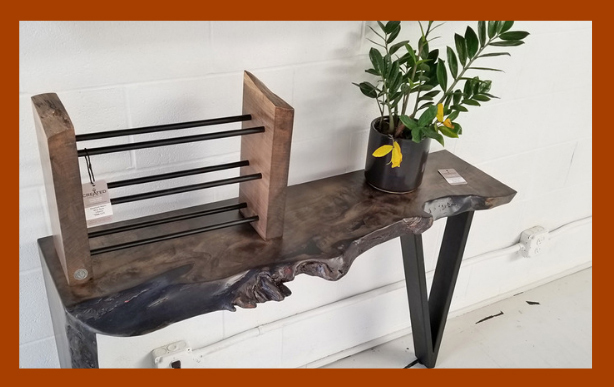 It’s almost as though Black Walnut hardwood has some mysterious power over humans, causing us to want it more even as we collectively drive its price higher. Rising overseas demand for U.S. hardwood is also driving the cost of walnut higher. Temperate hardwood includes such species as ash, cherry, maple, oak and walnut. Thanks to careful stewardship of its forests – the U.S. grows more new hardwood each year than it harvests – the U.S. is able to supply rising worldwide demand. For perspective, it’s estimated that 60% of all hardwood lumber produced in the U.S. is exported, and that half of exports wind up in China. Between 1992 and 2017, hardwood lumber exports to China ballooned from $8 million to $1.5 billion, according to the American Hardwood Export Council. China is the world’s largest producer of furniture, and 20 percent of the furniture that the Chinese manufacture is exported. Prior to 2008, China exported 80 percent of the furniture it made. The drop over time – from 80% to 20% – reflects China’s rising domestic demand and is yet more evidence of the country’s socioeconomic gains over the past decade. Black Walnut hardwood trees are typically worth $1000 and more. A pristine log, 26 inches in diameter and 16 feet long, can fetch up to $3,000, according to an article on the Iowa Department of Natural Resources website. Due to their rising valuations, Walnut trees are increasingly the target of tree thieves. Reports of walnut tree theft by unscrupulous loggers looking to make a quick profit are becoming a regular occurrence across the region where the species is common. Using a litany of excuses and suggesting myriad alleged misunderstandings, more and more frequently tree thieves are cutting down valuable walnut trees growing on private property without the prior permission of landowners. And of course, once a tree has been cut down, there’s no going back. Fortunately, states are recognizing the threat and enacting stiff penalties for such crimes. What is your Walnut Tree Worth? If you happen to have walnut trees on your property that you are considering selling, here are a few points to keep in mind. the number of major defects in the trunk. In order to qualify as Grade A veneer, your tree will need to be at least 19 inches in diameter (60 inches in circumference). A black walnut tree that is Grade A-veneer at 19 inches diameter might sell for $700–$800. If you’re the patient type, you might consider waiting until the tree grows another 6 inches in diameter, when it might fetch twice as much. Summertime Care for Your Butcher Block Starts with Mineral Oil! 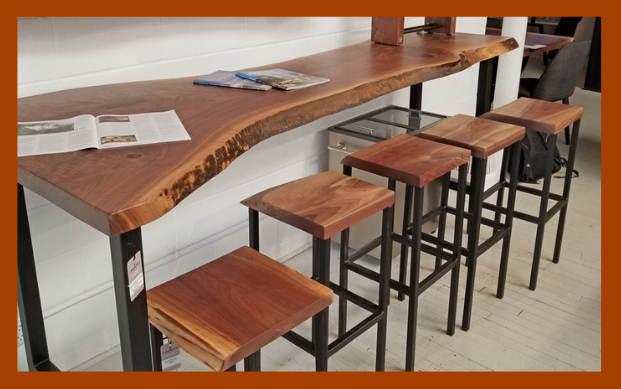 Whether you have a traditional end-grain butcher block, a butcher block countertop, or a cutting board version, it is critical this summer that you apply mineral oil to your butcher block. Moisturize – Butcher Block with an oil finish needs to be re-oiled with mineral oil to keep it from drying and cracking. Summertime is here! Temperature and humidity changes could cause your butcher block to dry and crack. Exposure to extremes in humidity can swell and shrink a butcher block enough to cause checks in its surface. And high temperatures certainly can dry out the wood and cause cracks. What is the remedy? Oil your butcher block with food-grade mineral oil! You can extend the beauty and life of any butcher block with a natural oil finish by reapplying butcher block mineral oil NOW and every 4 weeks. If you use your block every day, moisturize more often. This will help prevent it from drying out and cracking. Apply a generous amount of mineral oil to the butcher block surface then spread it evenly using a plastic grocery bag. (This is preferred to using a cloth, which will absorb too much oil). Smooth it over the entire top and sides of the block. Allow it to stand overnight. In the morning, remove any excess oil with a paper towel. Protect – Reapply a board cream to lock in moisture and provide a protective barrier. An especially effective maintenance regimen involves the use of both block oil and board cream. We recommend you first apply a coat of John Boos Mystery Oil (their proprietary mineral oil based product) following the instructions above. The mineral oil will penetrate deep into the block moisturizing the wood. Then apply John Boos Beeswax Board Cream to lock in the moisture and leave a silky, wax barrier on the surface of the wood. Avoid Sun and Water – Store your butcher block and cutting boards out of direct sunlight and keep them away from standing water. Direct sunlight on wood is a no-no. When possible, move your wood blocks, cutting boards, and even wooden utensils out of direct sunlight. And always wipe up spills on butcher block right away. Any standing water on a butcher block, especially one that is not moisturized and sealed, can cause damage. 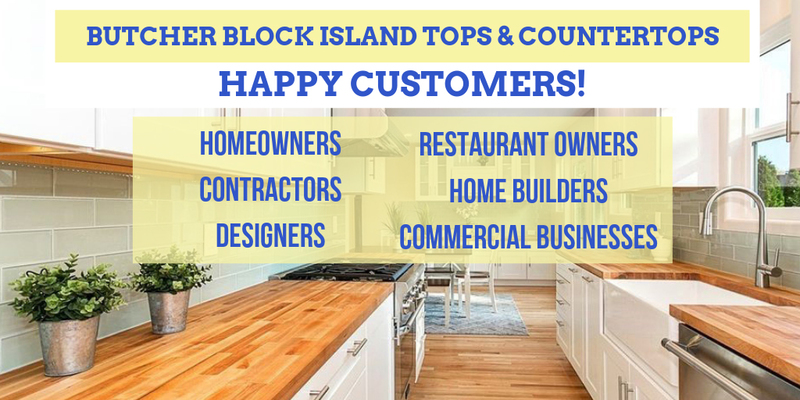 Given the cost of butcher block can be significant, caring for your butcher block will protect your investment down the road. These helpful tips are applicable any time of year, not just summertime. So, remember to keep your butcher block healthy and protect your investment with a little tender loving mineral oil care. 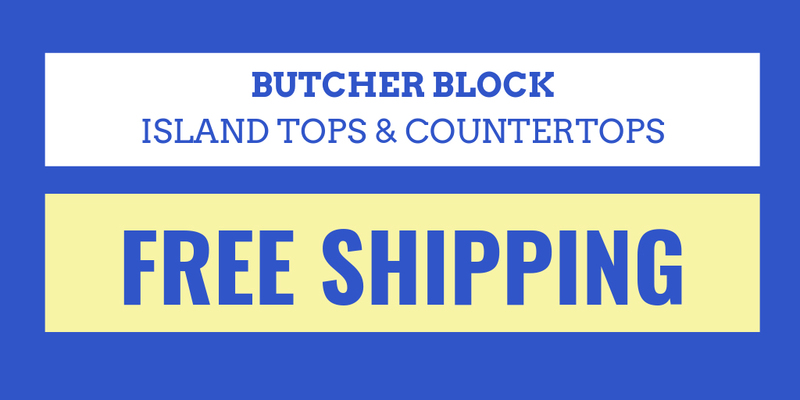 If you seek more information, reference our Complete Butcher Block Care and Repair Guide. Trees are sustainably harvested and taken to the lumberyard, where it all begins. With that in mind, Butcher Block Co. is pleased to share with you how John Boos & Co. makes its famous Boos Blocks. It all begins with the procurement of high-quality raw material harvested from North American hardwood forests. Boos & Co. sources hardwood only from forests which are certified as followers of sustainable forest management practices. Thanks to vigilant oversight by the Forest Stewardship Council (FSC) and the National Hardwood Lumber Association (NHLA), since the 1940s, U.S. forests have added more new growth each year than the country has consumed. Lumber is stored then dried in a kiln to the optimum moisture content prior to production. Harvested hardwood is stored in an outdoor staging area for several weeks before it is moved into a huge kiln, where it is dried for up to four weeks. The boilers used to heat Boos’ wood-fired kilns are fueled by burning scrap wood and sawdust – byproducts of the butcher-block-making process. Dried wood planks are passed through a planer and sander prior to being ripped down into rails. Wood planks transferred from a kiln to the manufacturing plant are first planed and sanded, then rip-sawed into rails 1-3/4 inches wide. Inspectors use fluorescent markers to identify defects in the wood rails, enabling a scanning & sawing tool to cut rails void of major defects. Lower-quality rails are set aside for use in industrial-grade countertops, in which imperfections are likely to show. Industrial-grade glue is applied to wood rails to bond them together. In making an edge-grain butcher block, Boos uses industrial-strength glue to bond together any number of rails cut to the same length. That block is subjected to heat and pressure for a specified period of time in order to ensure thermo-bonding is thorough and complete. Multiple edge-grain blocks are glued on top of each other to create a classic, end-grain block. An end-grain butcher block – easily recognizable due to its checkerboard cutting surface – is actually constructed of multiple edge-grain blocks. In making an end-grain block, glue is applied to the surfaces of edge-grain blocks which are then stacked atop one another. The resulting composite block is then placed in a giant vice called a screw press, which applies pressure over time. Once set and dry, the block is rotated 90 degrees so one of its two “checkerboard” surfaces faces up. This surface shows the cut ends of the wood rails used in its making; that’s why it’s called an “end-grain” block. A liberal amount of Boos Beeswax Board Cream is brushed onto this end-grain butcher block. Next, the butcher block is machine and hand-sanded to provide a smooth finish. Finally, a coating of food-safe Boos Beeswax Board Cream with beeswax is applied to the entire surface of the block. It’s important to keep a butcher block well-oiled in order to protect it from drying out and cracking and to extend its useful life. 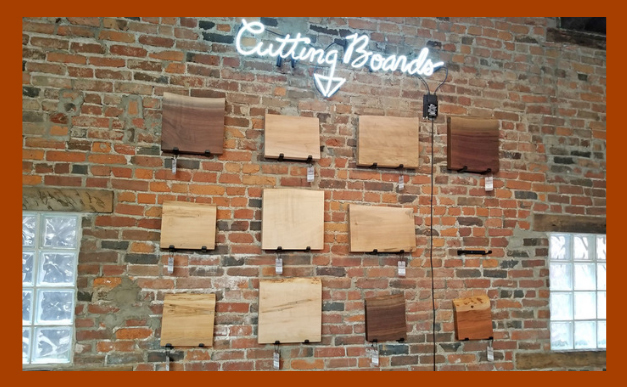 As the premier online dealer for John Boos butcher blocks, Butcher Block Co. is proud to highlight John Boos & Co. during the National Week of Making. 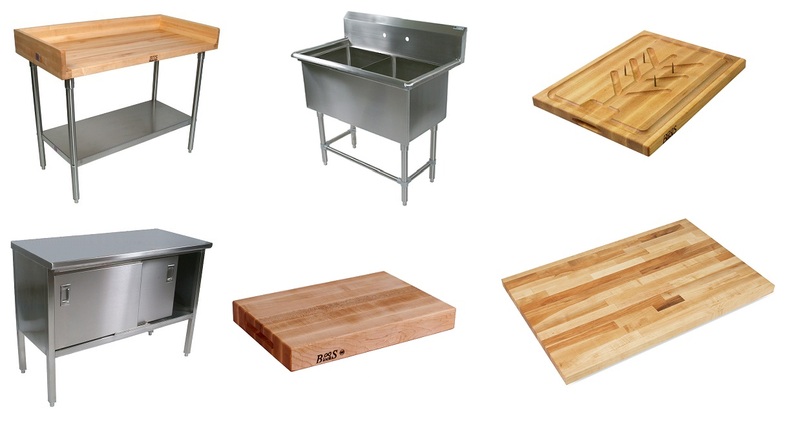 Visit our website to browse John Boos standing butcher blocks, countertops, tables, carts, cutting boards and more.